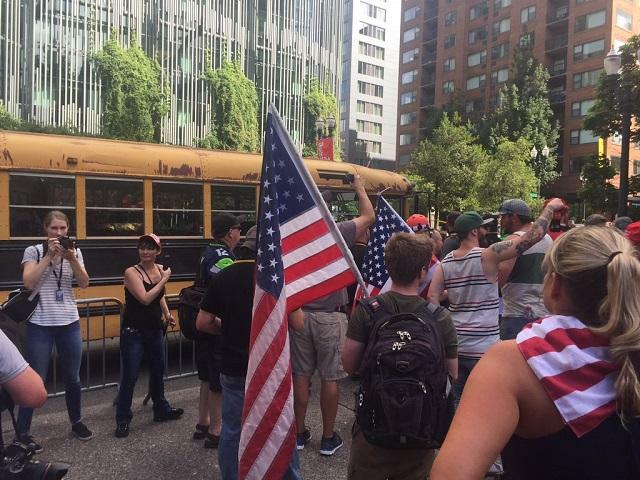 PORTLAND, Ore. -- Two opposing protest groups -- Patriot Prayer and antifa -- clashed in downtown Portland Saturday, CBS Portland affiliate KOIN reports. Portland police said failure to leave the area could leave to arrests, calling the demonstration a riot. More than 100 members of Patriot Prayer group gathered at Terry Schrunk Plaza for a "freedom rally," while more than 100 counter protesters with an antifa group gathered across the street at Chapman Square for rallies before a march. Police revoked Patriot Prayer's permit for the rally after the two groups began to clash. People were lighting firecrackers and smoke bombs in the crowd while police used flash bangs in an effort to disperse the clashing protesters. Police tweeted Saturday night they used "aerial distractions" and not tear gas. Portland Police have used aerial distraction devices in today's protest. Portland Police have not used tear gas as some are reporting. Patroit Prayer organizer Joey Gibson told KOIN the clashes "good in terms that we showed that there's a political move right now to have the police stand down in order to impact free speech in some of these big cities." "Portland's the last city on the West Coast that's doing that, so we just have to keep hitting it -- I don't see what else to do other than that," Gibson said. "We'll make Portland so ugly in terms of how they allow these protesters to charge us when we have a permit. The police stood down, we were told they would not stand down, so we have to challenge it." A group called Eugene Antifa created a Facebook event called "Defend PDX: Patriot Prayer's violence must end"
"It is very important that antifascists keep up the pressure so that we can stop them once and for all," the Facebook page says. Portland police told KOIN there would be "significant law enforcement precense" downtown. KOIN reports that police were already dressed in riot gear before the 4 p.m. start time. The protest was similar to June 3 demonstrations near City Hall in Portland, Oregon, which led to four arrests after clashes between right-wing groups and antifa. Thousands of people protested earlier Saturday against the the Trump administration's family separations and across the Columbia River in Vancouver, Washington. Hundreds of rallies were held nationwide to protest President Trump's "zero tolerance" immigration policy. U.S. Sen. Ron Wyden, an Oregon Democrat, blasted Mr. Trump's immigration policies and asked the crowd what score the president would get for his zero tolerance policy. The crowd shouted back, "Zero!"